Distributed By – Asociación Fonográfica Nacional - "Asfona" M.R. 1st UK pressing on 'plum' label which is red/white/plum. Feather symbol on side 2 is inverted. This label layout identify the first pressing. It is part of the first production batch of the UK red/plum Atlantic label for this title. Same for labels versions 2, 3 and 4. No mention of Superhype Music Inc.
Executive Producer credit for Peter Grant (which was removed in various ways from all subsequent pressings - see below). Heavyweight unlaminated gatefold sleeve, printed and made in England. Inner sleeve has lyrics to 'Stairway to Heaven' on one side and track titles and credits on the other. The first inner sleeves are dark gray with two foldback edges to the side. Interestingly, whilst Jimmy Page succeeded in having the Peter Grant credit removed from the labels, they were never removed from the inner sleeves. There are currently 8 verified and known 'plum' label variants. 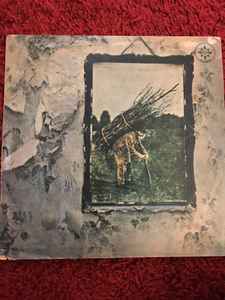 This release was commonly referred to as 'Led Zeppelin IV', to follow in sequence with their previous three releases, but no actual title appears on the release.